I was trying to wrap up the pictures and the posts from the end of the year, and kept coming across more pictures of me being out and about enjoying tasty beers! 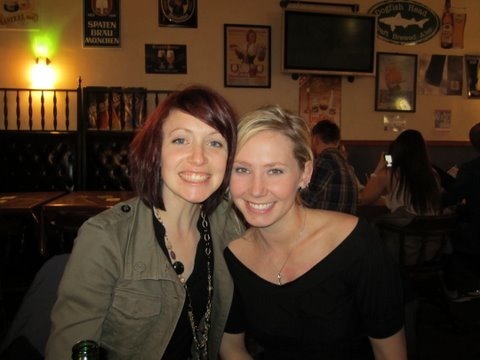 So, while I cant tell you exactly when this was, good beers were had and it was a very fun night! 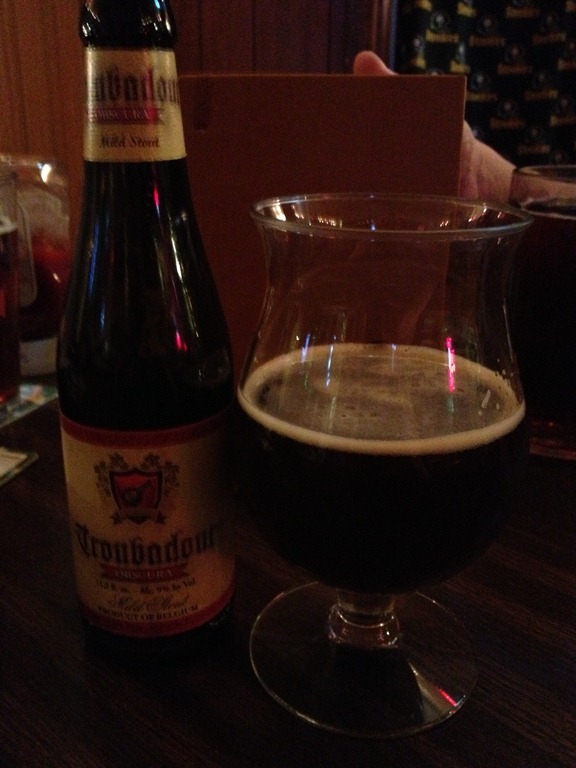 Apparently I started off my night with the Troubadour Obscura by Brouwerij de Musketiers of Ursel, Belgium at 8.5% abv. And I enjoyed it so much, or was too busy/lazy to pick a new beer that I had two! That’s unusual. I almost never drink two of the same beers in a row. Or even two of the same in one night. But I guess I cant blame myself, it is a very good beer. Technically this beer is considered a stout. But it’s a Belgian stout and not like a regular stout. 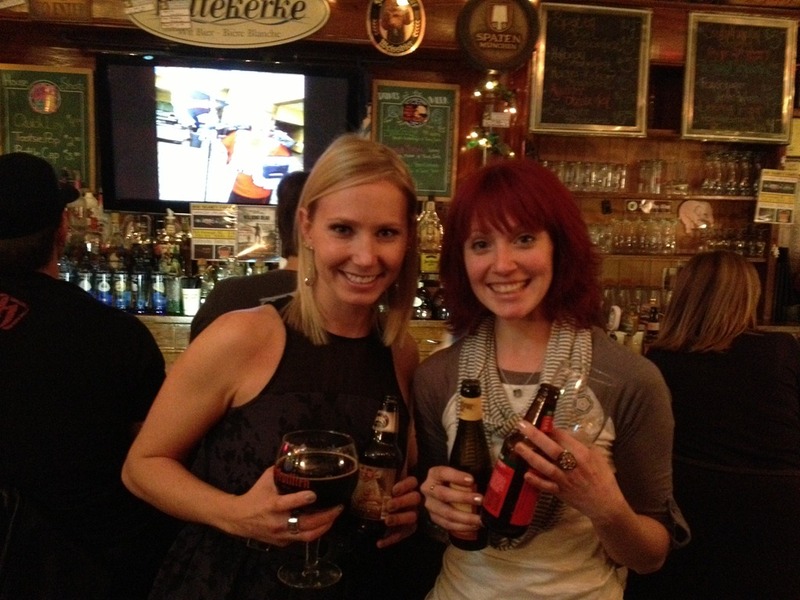 It doesn’t have that typical roasted taste and quality that most traditional stouts have. Its still bottle conditioned and you can still taste the heavy yeastiness to it. Also, figs, mild chocolate, and not exactly sour, but a slight acidity. More like a quad than a stout. Next up, I believe I told the bartender to surprise me. I know that most of the bartenders at the saloon know my beer preferences and I like to see what I get sometimes. They always pick great beers, like the Founders Breakfast Stout by Founders Brewing Company of Grand Rapids, Michigan at 8.3% abv. Quite a bit of coffee up front and also a creamy milk chocolate. Toffee and charred wood. Toasted oatmeal, and vanilla. Dry finish and slightly bitter. 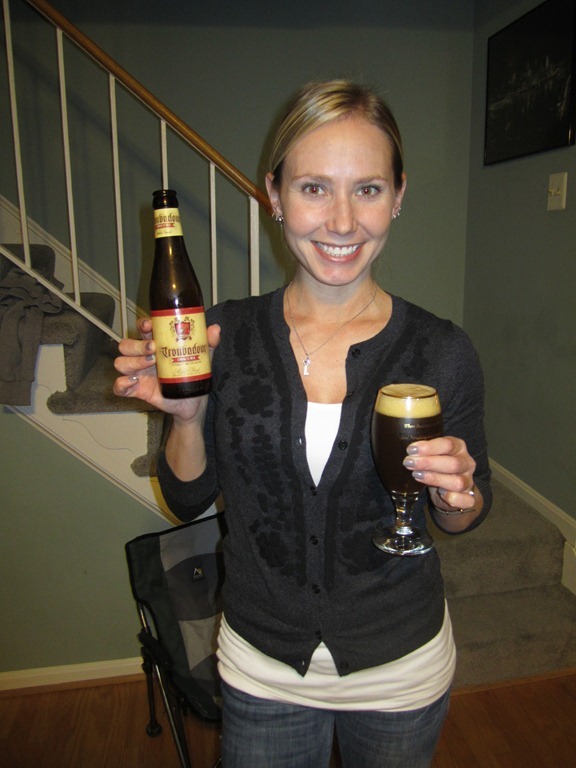 A phenomenal beer, and I don’t even mind that it tasted like coffee! 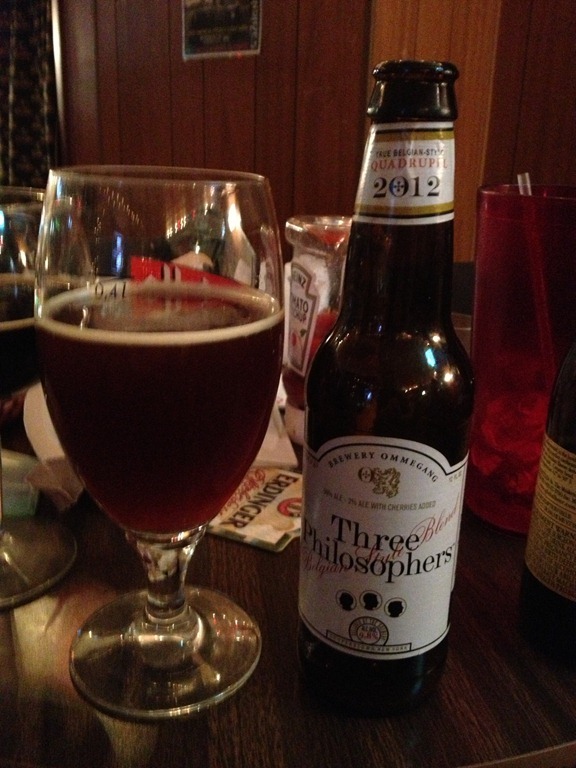 I also went back and tried an old favorite of mine, Three Philosophers by Brewery Ommegang of Cooperstown, New York at 9.8% abv. Not nearly as in your face as Kasteel Rouge, its more of a tart sour cherry. And much more of an actual beer. Bread and yeast, dark fruits, caramel. The cherry is definitely there but its not a sugary syrup. It doesn’t come off as a candy beer. Very enjoyable! I love this beer, but one of the other girls ordered the Bornem Dubbel by Brouwerij Van Steenberge of Ertvelde, Belgium at 8% abv, and I think they had meant to get the triple and wasn’t happy with their beer choice. 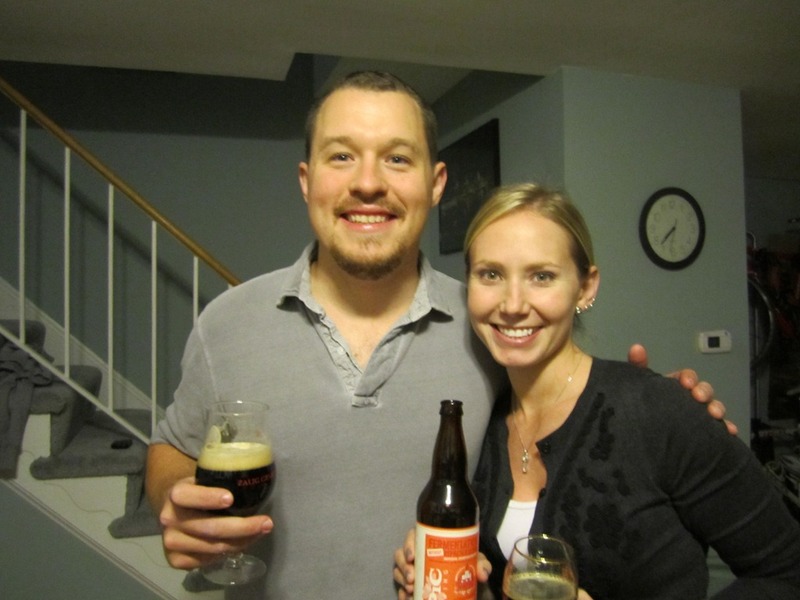 I cant stand to see a good beer wasted, so we swapped beers! Heavy on the malts, lots of toasted bread, brown sugar, raisins. Full bodied and smooth. A hint of acidity as an aftertaste. But not a heavy beer, still feels light. It was an interesting beer night because I ended up with a few beers that I didn’t pick out myself, but was very happy with what I got! Thursday night Jack cooked meat pies again! We ended up inviting quite a few people, not a problem, but I think we need to invest in a few extra chairs! The meat pies are kind of make-your-own, similar to tacos. We roll out biscuit tops and bottoms and you can choose meat type (chicken or pulled pork), cheese (blue, mozzarella, or cheddar), and fillings like mashed potatoes, veggies and spices. 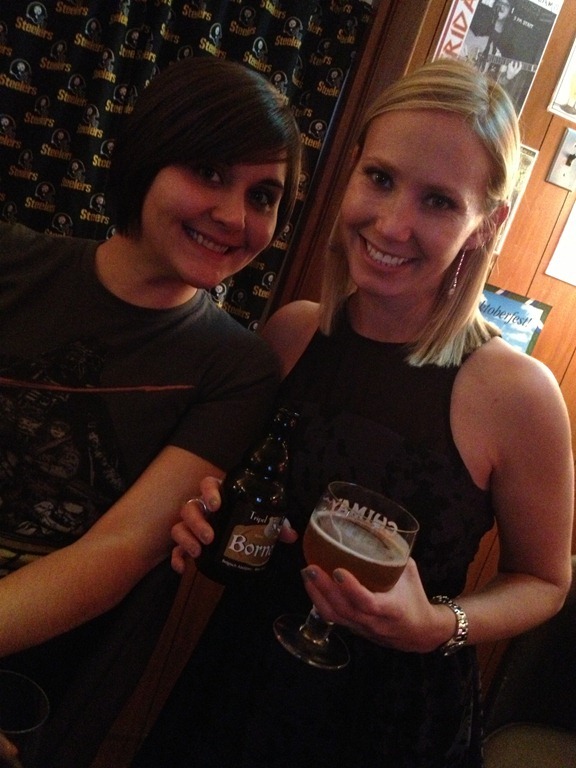 Of course there was lots of beer to be had! Steve showed up before anyone else and brought a beer, so we split it 3 ways. 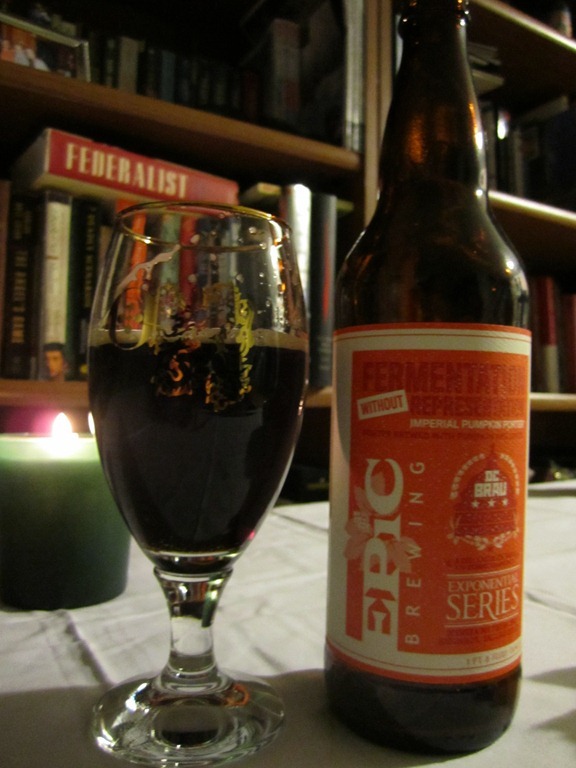 We tried Epic Fermentation Without Representation Imperial Pumpkin Porter by Epic Brewing Company Utah 7.5% abv. Its really strange having the dark roasted malts of a porter and mixing in the spices of a pumpkin pie. Cloves, nutmeg, cinnamon. We didn’t get too much pumpkin flavor, but we did get a whole lot of flavor. Also had hints of chocolate and vanilla, very smooth. Thanks Steve! 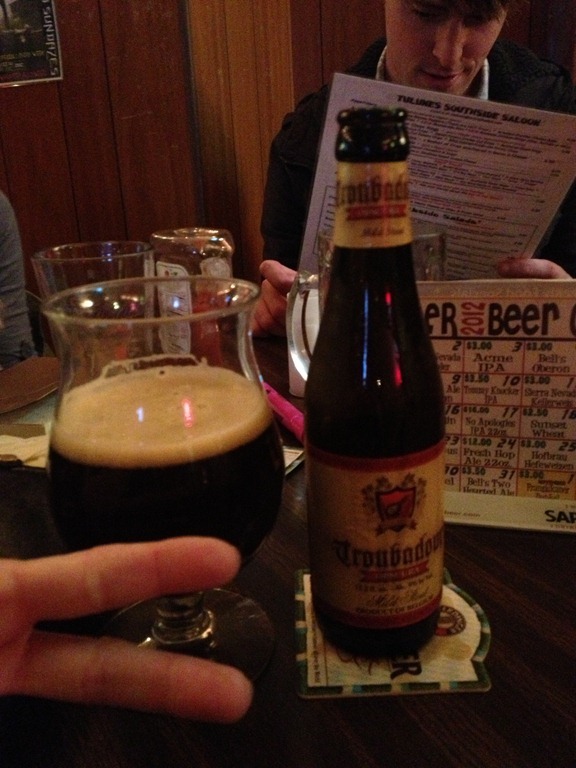 Next, to go with my meat pie, I had a Troubadour Obscura of Brouwerij De Musketiers in Ursel, Belgium at 8.5% abv. I think I may have already discussed this beer on here before, but it’s truly one of my favorite go-to beers. It’s hard to find stouts coming out of Belgium, and I love stouts and Belgium beers so it’s a no brainer that I love this beer! I think it’s actually considered a mild stout, not 100% sure what that actually means, but compared to the other stouts I normally love, this beer is a little on the thinner side. It makes it very drinkable, but does not have that full, rich mouthfeel. Dark caramel malts, and slightly fruity, subtle chocolate. 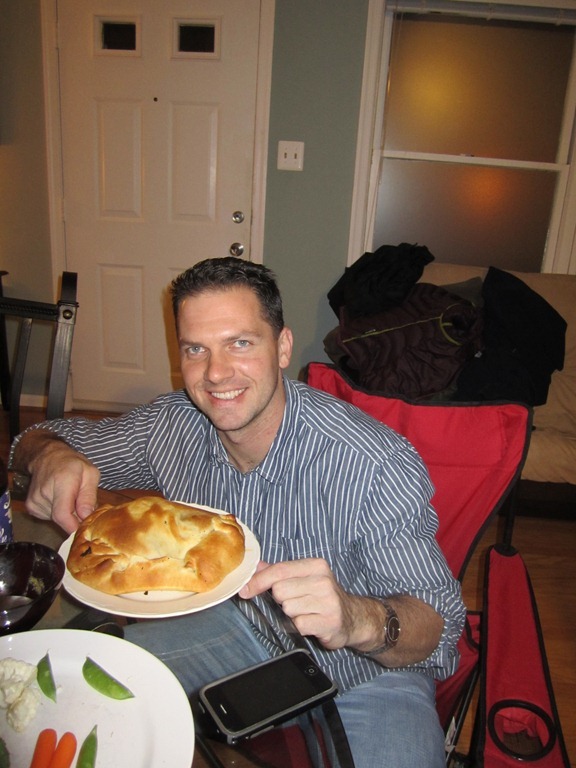 Ryan had the biggest meat pie ever! 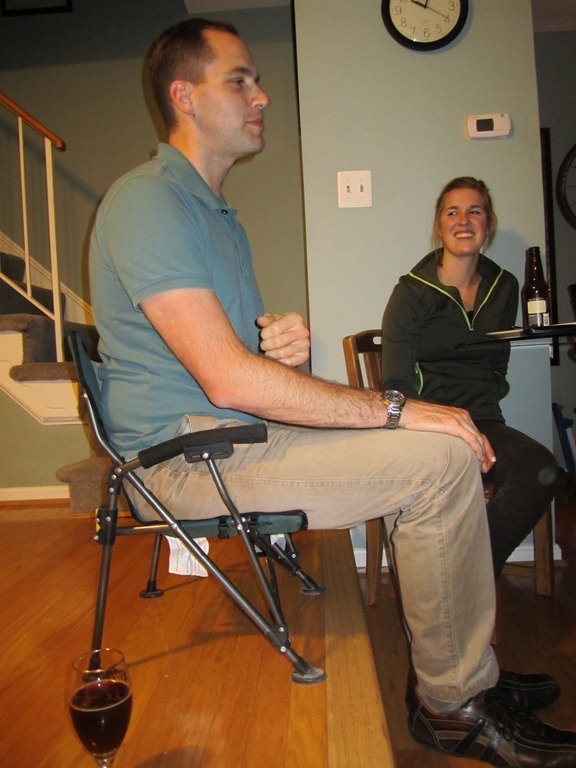 And Dave was the biggest man in the tiniest chair! And I had another beer for my after meat pie dessert! I drank the Wychwood Hobgoblin by Wychwood Brewery Company of Witney, Oxon, UK (England) 5.2% abv. 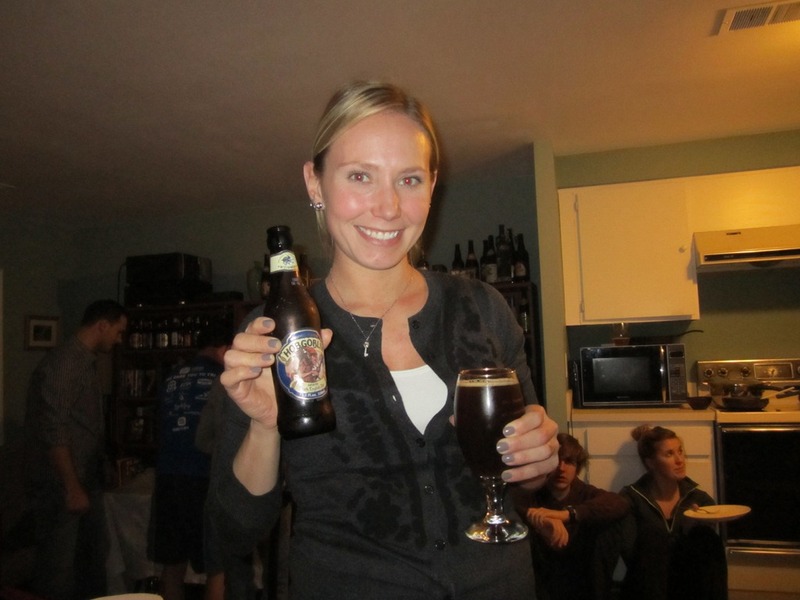 Its considered an English Brown Ale and I think its very well done. Caramel and brown bread, malty, not too sweet, almost tangy. Smooth and a little bit of a dry finish. I think everyone left full. We even had enough left over that Jack and I were having meat pies for the next day! Friday night, I was feeling a little under the weather with a lot of sinus pressure, but we still made it out to my favorite bar on earth, Tulune’s South Side Saloon. This is the bar where I began to learn about good beer. As soon as I walked in I saw Joe, who has been voted Johnstown’s best bartender a few years in a row now. He really knows his beers. Every time I walk in he updates me on what’s new and knows exactly what I will like and what I should try. This time when I walked in, he was pretty busy but he came over and gave me a Chimay bottle opener, win! 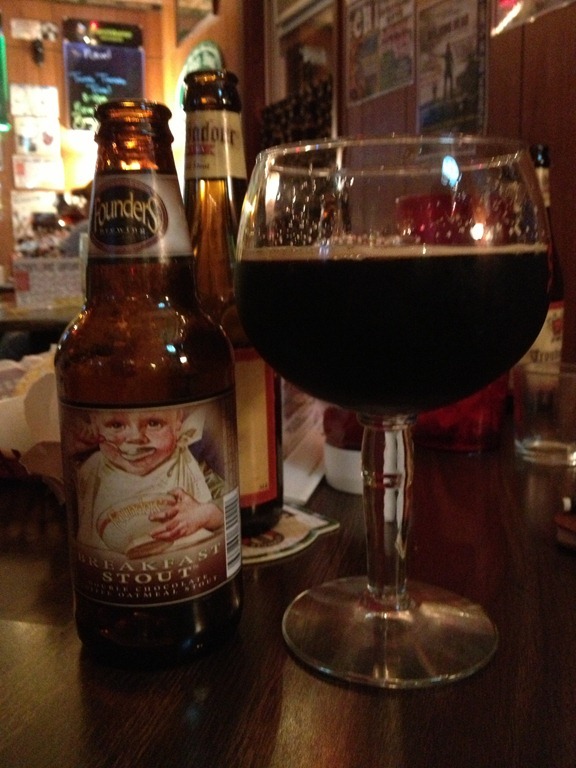 I got the Troubadour Obscura, which is from Belgium and is considered a mild stout. Unfortunately I couldn’t really smell anything and it really took away from the taste and experience of the beer. Luckily, I’ve had this beer many times before and I was able to appreciate the taste that I knew I was missing out on. I was worried I wouldn’t get to see Tara and Mike since they had to go to a wedding in Ohio the next day. Mike had to work, but Tara made it out for a little bit! I ended up only having that one beer because not being able to taste anything was really depressing. But being back in my favorite bar with my favorite people made up for it!